In a recent survey of 1000 customers, 95% said they would recommend Signs Express, here are some reasons why, we are a one-stop-shop for signs and graphics solutions, we pride ourselves on our attention to detail, ability to assess our customer’s needs and bring value to budgets. 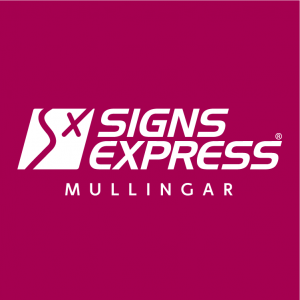 Offering a complete service from design, manufacture and fitting across a wide range of signs and graphics solutions, Signs Express (Mullingar) is part of a nationwide network of sign production centres which has been established for 25 years. We help organisations of all sizes and industries with the signage requirements. From fascia signs to vehicle graphics or window displays and directory systems, our experienced sign makers are able to assess customers’ needs to specify the correct signs and graphics; always looking to achieve the best possible results. With the use of signage its a great tool to brand, market and protect your business. We’re a signs and graphics company that knows how to make signage work for our customers.